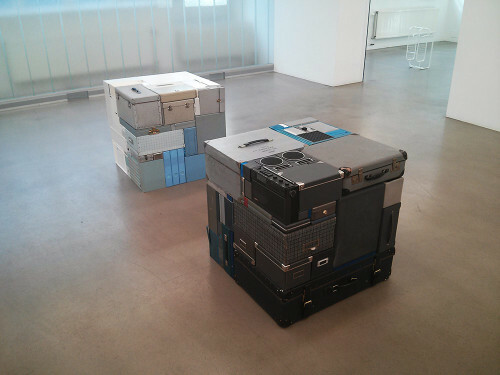 Michael Johansson‘s exhibition at Andersson/Sandström was a memorable part of my Stockholm gallery hop. The gallery, a prominent blue-chip exhibitor of mostly Scandinavian artists, is located in the Normalm district on the city’s northwest side, in a pristine white-cube ground-floor space. Johansson’s installations are difficult to describe without wearing out vocabulary: they are arrangements of objects fitting together perfectly, creating ostensibly ideal sculptural forms out of disparate found objects, connected by their emergent geometries. A thrift store Jessica Stockholder gone minimalist. Along with several sculptures of life-sized objects in the style of injection molding sprues, Johansson’s work proposed a kit-bash relation to the world of things, sourced for their formal properties, their color and shape and texture, and devoid of meaning, but open to infinite fidelities and creative arrangements.